SR6600 is a fast and steady storage system with RAID controller. It possess the capability of capacity expansion up to 5 hard drives and supports RAID 6 with high data security. 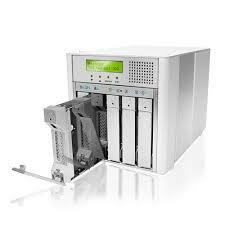 It offers 4 types of host interface – SCSI, eSATA, USB and FireWire 800. With built in RAID controller, the SR6600 external hard drive enclosure works independently and does not affect the system’s performance. SR6600 is perfect solution for SOHO or SMB to store and back up data or use for video editing or DVR where reading and writing big files at the same time are necessary requirements.